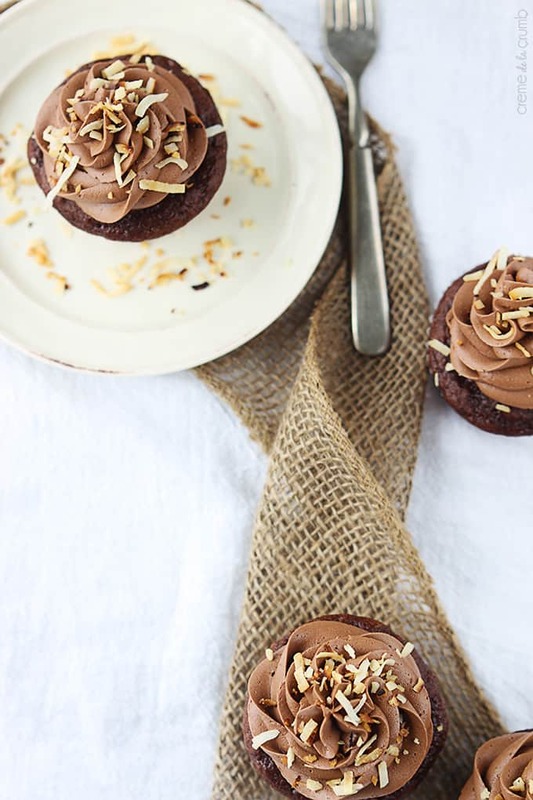 Perfectly moist chocolate coconut cupcakes with fluffy chocolate coconut buttercream frosting! I think it’s only appropriate that I share a recipe that has something to do with my mother today. Now my chocolate obsession, I owe 100% of that to my Pops. But the coconut? That’s definitely a direct result of my mother’s sweet tooth. She loves coconut. And now I’m carrying on that delicious legacy. While we are on the subject… Happy Mother’s Day!! I’d like to take this opportunity to give a BIG FAT SHOUTOUT to my own super-mom who has been there for me through everything this life’s thrown at me. And until I got married to the love of my life, she was my number one fan for 20 years. Love that woman. 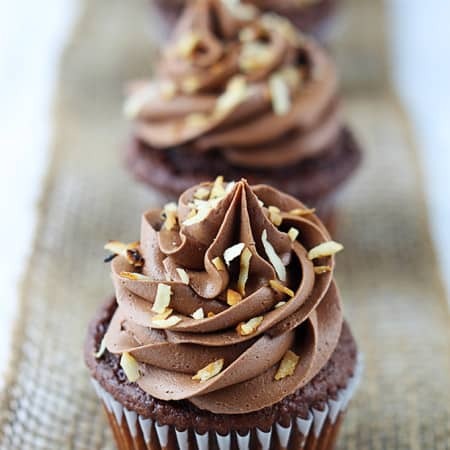 Now back to the cupcakes – these are incredibly moist and fluffy, just how I like a good chocolate cupcake. But the best part is that there’s some coconut flavor in there mingling with the chocolate. It’s a love affair of goodness I tell ya. And it’s all over the place cause the frosting is loaded with it too. 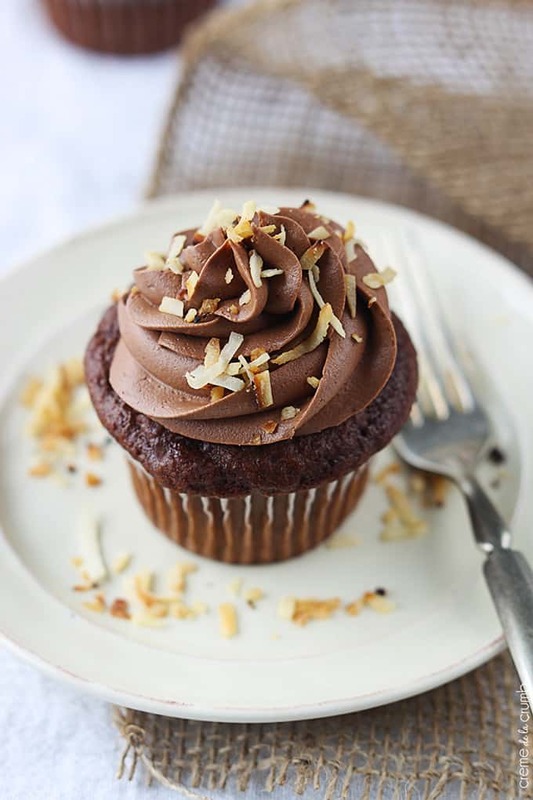 How can you resist a perfect chocolate cupcake when it’s got coconut too?? You can’t. You just can’t. Preheat oven to 350 and place cupcake liners in muffin tins. Sift cake mix into a medium bowl and set aside. In a larger bowl mix together eggs, oil, greek yogurt (or sour cream), vanilla, coconut, and milk. Mix in cake mix until smooth. Fill each liner 3/4 full. Bake 15-20 minutes until an inserted toothpick comes out clean. For the frosting, beat butter until very light and fluffy (about 2 minutes). Mix in cocoa powder, coconut, and 3 tablespoons heavy cream, mix until smooth. Mix in 3 cups powdered sugar. Add additional cream and/or powdered sugar until desired consistency is reached (*for piping you will want to double the frosting recipe and look for a slightly stiffer consistency). Sprinkle with toasted coconut flakes if desired. Store in airtight container at room temperature up to 3-4 days. Enjoy! These cupcakes look so good and I love your photographs! These cupcakes look crazy good, Tiffany! LOVE the photos! Pinned. have you tried using coconut milk instead of regular milk? i was thinking about making these tomorrow and wondered if i could substitute coconut milk for regular milk. HI! 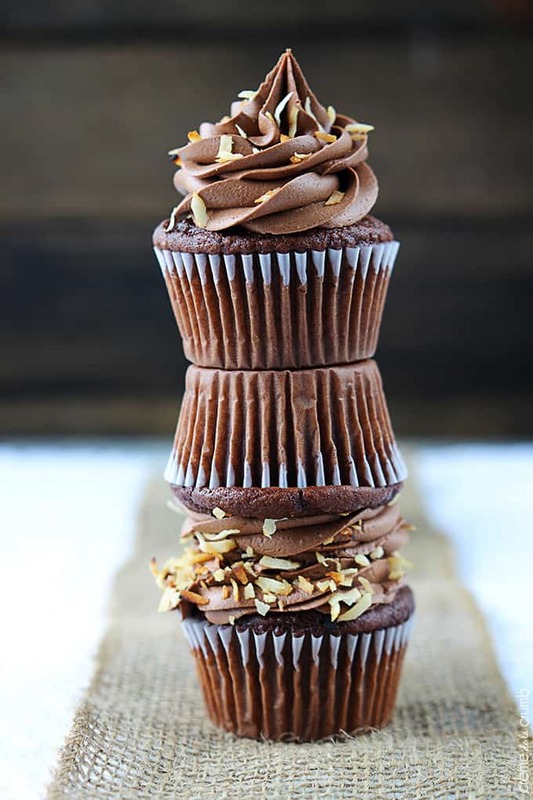 These look fantastic….have you (or anyone) ever made this as a cake as opposed to cupcakes? I made these for my son’s 3rd birthday and they were a huge hit! I used light coconut milk instead of the milk and heavy cream, and they were just wonderful. The cake is light and fluffy yet very moist. And the frosting… yeah, let’s just say there was no frosting left over thanks to me. Beautifully done. I would have preferred a scratch cake recipe, as I tend to avoid the artificial stuff in mixes, but one occasion won’t kill us haha! 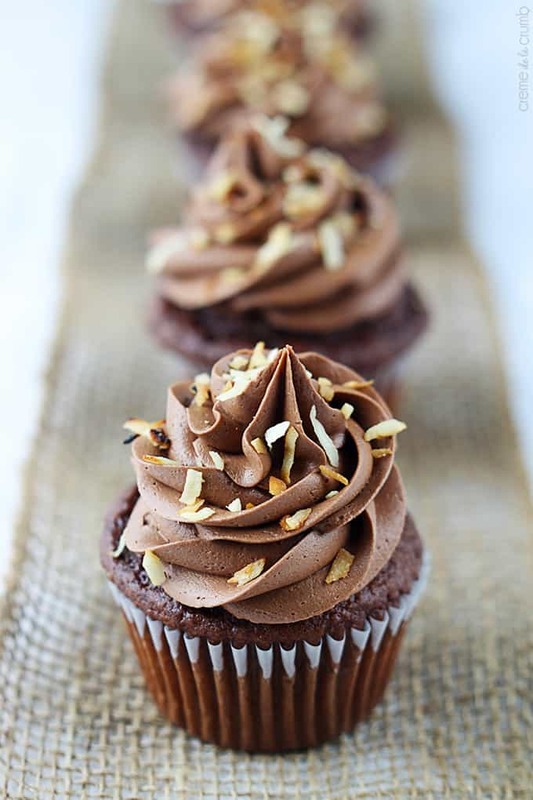 A combination of chocolate and coconut, I love it! Thank you for sharing the recipe! !